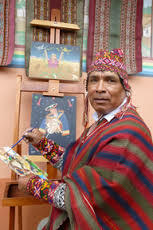 On Saturday, March 22nd a reception at 6:30pm will begin an evening of storytelling, music and art celebrating Incan life at the Mariposa Museum. 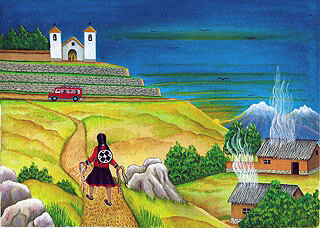 On exhibit will be original illustrations by Peruvian painter Angel Callañaupa from the storybook “Beyond the Stones of Machu Picchu—Folktales and Stories of Inca Life” written by Elizabeth Conrad VanBuskirk. At 7:00pm poet David Weinstock will read several stories from VanBuskirk’s book including “The First Hair Cutting” about an Andean child’s coming-of-age ceremony, and “Ice Mountain,” recreating a village’s pilgrimage to its sacred peak. During and between stories, musician Armando Zarazu will perform traditional Peruvian compositions on guitar, mandolin, charango (a small lute) and quena, a wooden flute. David Weinstock is a poet and writing coach in Middlebury, Vermont. He conducts the Otter Creek Poets workshop, of which Elizabeth VanBuskirk is a longtime member. Musician, Armando Zarazu performs traditional Peruvian compositions on a variety of instruments. Born in the northern part of the Peruvian Andes and living in Newington, Connecticut, he is also a High School Spanish teacher, writes for “Identidad Latina”, and is the editor of the magazine “Vidaen,” both Spanish language publications, and is the radio host of “Mi Perú” on Trinity College WRTC-FM. 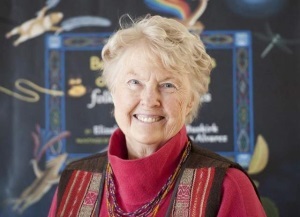 On Sunday, February 16, Vermont’s only weekly newspaper published a four page story about Beyond the Stones Machu Picchu: Folk Tales and Stories of Inca Life and Elizabeth VanBuskirk. One page featured a “Heart of the Art” writeup by the author. “Charlotte author releases book on Inca life,” from page one The Citizen On Sunday, December 8 at 4 p.m the Flying Pig Book Store will sponsor the launch event for Elizabeth Conrad VanBuskirk’s new book, “Beyond the Stones of Machu Picchu: Folk Tales and Stories of Inca Life.” The author will talk about “Life and Art in Inca Villages” and read a story from the book. The event will be held at Sheburne Town Hall, Shelburne, Vermont.